A federal immigration program that promotes information sharing between local law enforcement and the FBI is being rolled out Tuesday in Vermont. Federal immigration officials have activated the Secure Communities program statewide. That leaves Maine as the only state in the nation that hasn’t yet launched the fingerprinting program. It was activated in New Hampshire earlier this month, and, despite widespread protests, in Massachusetts – one of the final holdouts – last week. In Vermont, some advocates of migrant farm workers fear the measure could lead to unnecessary deportations and undermine the state’s economy. They’ve objected to Secure Communities, saying it targets many immigrants with no criminal convictions. 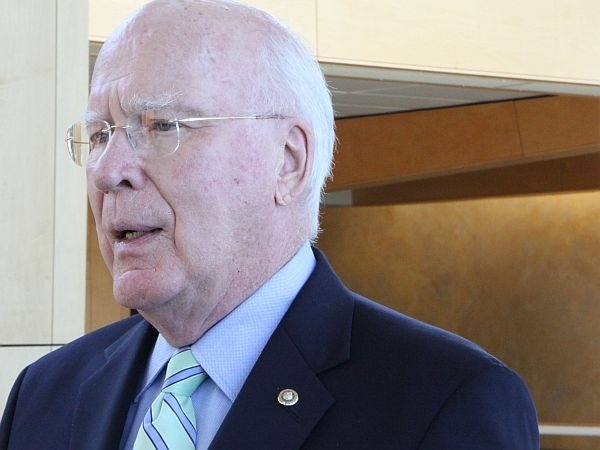 Senator Patrick Leahy says he’s still looking into the program, and he would like to see a comprehensive immigration bill that would allow migrant farm workers to stay in the state for a longer time. "You can’t say, ‘Well, we’ll get somebody in to help milk the cows three months of the year or four months of the year and then leave and come back again a year later," Leahy said. "It just doesn’t work that way." Before boarding a plane back to Washington this week, Leahy said Congress had a real opportunity for immigration reform under former President George W. Bush. "We had a bi-partisan coalition. Then the elections came. The far right fought it, and people backed off. You can’t do that. We need a major change on immigration laws. Not just for Vermont but for the whole country," Leahy said. The Immigration Customs Enforcement agency says Secure Communities has helped it to remove more than 135,000 immigrants convicted of crimes. Now, largely in response to criticism, ICE says it’s adopting a new policy for minor traffic offenders so that they won’t be included in the program. You can see what jurisdictions have been activated here.